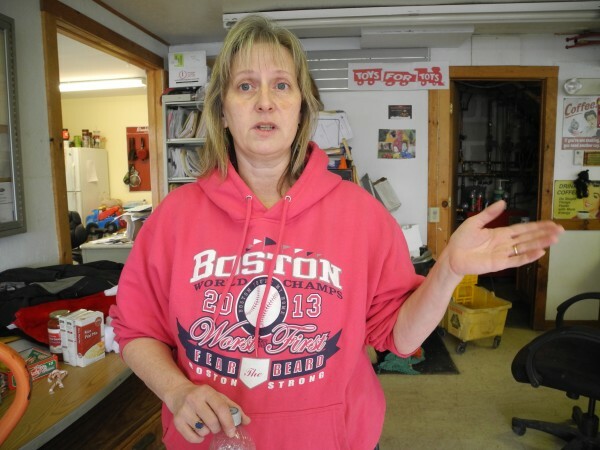 Susan Totman stands in her small family garage business on Jan. 7. She expressed her concerns about the natural gas compressor station she lives near in Searsmont. 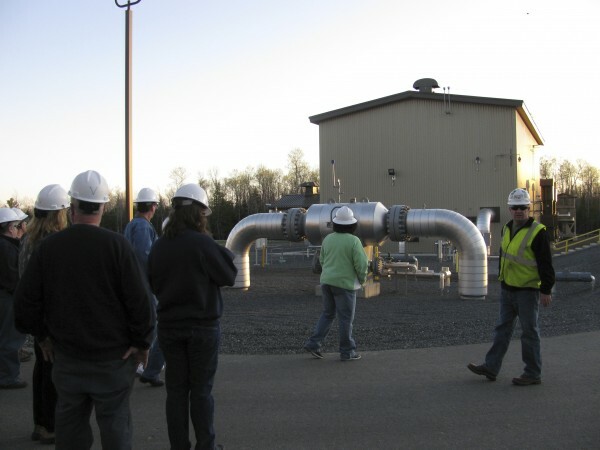 Steve Leary, an area supervisor for Maritimes & Northeast Pipeline, leads a group of Searsmont residents on a tour of the New England Road natural gas compressor station in this April 2010 file photo. SEARSMONT, Maine — First came the noise late New Year’s Eve at the Searsmont natural gas pipeline compressor station, so loud that it caused nearby homes to shake and some residents, frightened by the jet-engine-like roar, to pack up their cars and flee for the night. Then came the questions, as some members of the normally quiet rural community wondered how safe — or dangerous — it is to live so close to the Maritimes & Northeast Pipeline facility. The station was shut down for more than a week after the incident, though company officials confirmed Monday afternoon that it was running again. A compressor station is located every 70 miles along the American portion of the pipeline, which runs for 338 miles from Maine to Massachusetts. Officials at the company initially speculated that the recent extreme cold may have contributed to the equipment malfunction, but a Spectra Energy spokesperson said that the Searsmont station was the only one to undergo an emergency shutdown over New Year’s. That did little to quell the concerns of neighbors like Susan Totman. That night, she called 911, then the emergency number for the pipeline company. The Totmans, worried about their many pets, stayed at their home but sent their son and his family to a friend’s house in another town. A half hour after the noise began, Totman called the company’s emergency number again to find out what was going on. Totman believes that Spectra Energy officials have minimized the incident, telling residents there was no danger that night, and the automatic venting was a normal response to a breakdown in the system. On Jan. 2, Susan Waller, a spokeswoman for Houston-based Spectra Energy, said that her company had been responsive to the concerns of abutting landowners. At that time, the company had directly contacted eight residents and the town’s first selectman, Bruce Brierley. But Brierley said Tuesday that he doesn’t have a lot of information either. He said he anticipates there will be a lively discussion at the Jan. 21 meeting with the company. Waller said that in the event of a true emergency, local responders would evacuate residents and control traffic, while engineers would remotely shut the valves down to prevent gas from going in the Searsmont facility. Company officials did remotely shut down the gas going into the Searsmont station after the equipment malfunction that night, but no evacuation was required, she said. Chief James Ames of the Searsmont Volunteer Fire Department said he has a key to get through the first gate that blocks access to the compressor station. Beyond that gate, the firefighters must wait for company officials to give them information or further instructions. When the gas vented so loudly late on New Year’s Eve, Assistant Fire Chief Wayne Woodbury waited at the gate for about 45 minutes until a company representative drove in and asked him to make sure no one else came in to the compressor station. Ten minutes later, the noise started dying down. Woodbury called Spectra’s emergency phone number. In general, Ames said firefighters can do little at the compressor station. He said a lot of people called him immediately after the noisy night, and some from at least two towns away heard it. Others told him they could smell a faint rotten egg smell emitting from the station. “A lot of people are scared to death of this thing,” Ames said. It is unclear how a person is expected to evacuate. “Run like hell,” some locals speculated. The vented methane gas is not considered to be an acute hazard by the Maine Department of Environmental Protection. Thomas Smith, an oil and hazardous materials responder with the agency, said a couple of days after the incident that because the gas dissipates quickly, it has a very low probability of flame hazard. “That doesn’t mean that there’s a zero percent probability,” he said. Should there be a fire at the facility, what would typically happen is that the gas would burn to the top of the pressure release valve and “look like a big blow torch,” not a fireball, he said. His agency did not receive an emergency call that night and was not required to be notified. If they had been called, staffers would have gone to Searsmont to monitor the air quality around the gas venting, but after the fact, there’s nothing he can do. In fact, the incident fell only under the regulation of the U.S. Department of Transportation Pipeline and Hazardous Material Safety Administration. The Washington, D.C.-based agency oversees interstate natural gas transmission lines. Damon Hill, a public affairs specialist with the agency, said Monday that officials are reviewing what happened. To notify the Maine Department of Environmental Protection about future environmental concerns, call 800-482-0777. For Spectra Energy’s emergency number, call 800-231-7794.